Feel free to submit your favourite photographer's work here. 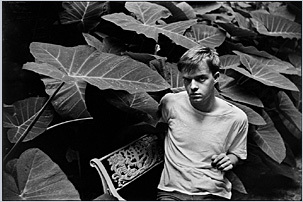 I am surprised at how Truman Capote looks there, I didnt picture him like that! Teams: Gli Azzurri and AC Milan. I think Steve Mc Curry has be be among the best photographers, He's potraited beautiful landscpaes, wars, culture and most important People all over the world. This pic of a young Afghanistanian girl with haunting green eyes from 1984 is a classic. Here's another young kid from Afghanistan. While here are 2 pics of beautiful landscapes of the country. "I think my greatest ambition in life is to pass on to others what I know"
"May you live to be 100 and may the last voice you hear be mine"
"There are as many opinions as there are experts"
The following are works by Tseng Kwong Chi (born 1950 Hong Kong; died 1990 New York City) who believed himself to be an ambassador who toured the world in perpetual motion. Tseng and his companion Keith Haring both died of AIDS in their favourite city. The photographs were taken using a single lens reflex camera with a self-timer. New York, New York, Statue of Liberty, 1979. Tseng Kwong Chi, Lake Louise, Canada (Hotel and Lake), 1986. Thanks for your kind words Bonita! Nice pics you posted yourself, I suppose Tseng Kwong Chi also is from HK. He made some great photo's on his trips around the globe for sure. Here are some more from Mc Curry I liked. Yann Arthus-Bertrand is not bad for computer desktop wallpapers . I have always preferred Diane Arbus' early photographs to her more popular images of freaks. As all Carroll admirers know, his book "Alice's Adventures in Wonderland" (1865), became an immediate success and has since been translated into more than eighty languages. The equally popular sequel "Through the Looking-Glass and What Alice Found There", was published in 1872. "St. George and the Dragon," 1875. The composition features Xie Kitchin and her three brothers, George Herbert Kitchin, Hugh Bridges Kitchin and Brook Taylor Kitchin. Alexandra (Xie) Rhoda Kitchin was the daughter of the Rev. George William Kitchin, Dean of Winchester and later of Durham. Dodgson began photographing Xie (pronounced "Ecksy") in 1868 and continued to use her as a frequent subject throughout the final years of his photographic career. He considered her to be one of his most amenable and striking models and recalled in an 1885 letter how he had "photographed her nearly 50 times: from 4 years old upwards." Dymphna Ellis, 25 July 1865. His subject later recalled that Carroll "came to our country house to photograph the children.… I feel sure I was a ‘favourite.’He made every child that. He developed the photographs in our cellar.… I remember the mess and the mystery.… We cried when he went away.…We were absolutely fearless with him. We felt he was one of us, and on our side against all the grown-ups." Margaret Anne and Henrietta Mary Lutwidge, ca 1859. Carroll photographed two of his maternal aunts in an early, classical photographic motif - the chess game. Both are world-famous photographers who have appeared regularly at National Geographic. He has won several prizes in the World Press Photo competition. This guy travels to the most remote and dangerous places on Earth and his reportage pictures are just amazing. Here are 2 pics from an American photographer who travels around the USA and takes pictures with a new Sony Ericsson mobile phone. It´s something of a marketing thing, but these pictures are really good, especially when you consider that they´ve been shot with a mobile phone. "Unsre Liebe unser Leiden unser ganzer Stolz bist du! Wir werden niemals untergehn wir werden immer zu dir stehn unsre Fahnen sie wehen auch wenn du mal verlierst, allez allez, Nürnberg allez......"
Last edited by audiollama; August 15th, 2005 at 18:30.